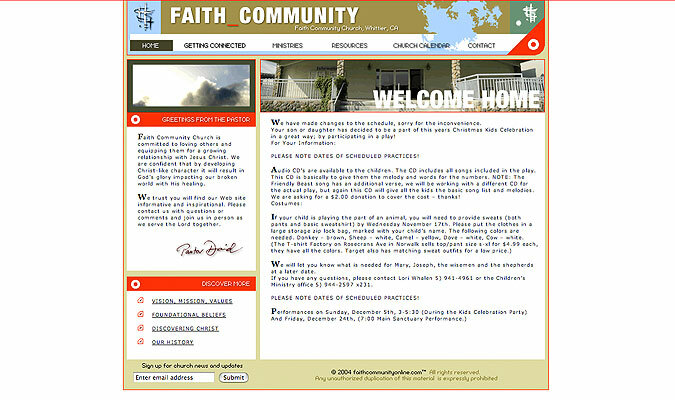 Faith Community Church had a website that they served them well for several years, but as they expanded their programs, their web needs changed. I was called in to rebuid their web presence from the ground up. I was able to use every tool in my toolbox for this fun project to, ultimately, make this site the central hub for FCC's diverse community. From the customized PHP calendar to Flash apps, and from streaming sermons, and straight-ahead CSS, this site was a real joy to see implemented. Site created with Dreamweaver, BBEdit, Fireworks templates, and Photoshop.